Dan Brown is one of my favorite writers. So, when I saw his masterclass, I could not resist taking this course. I was really pleased I did. It was fascinating and I learned a lot. This is a great course for anyone to take. You do not need to be a writer to enjoy it either. If you are a fan of Dan Brown, or thrillers in general, you will still find it fascinating and entertaining. Dan Brown’s introduction was great, masterful even. He starts by pointing out that when you write a book, you are actually not writing just one book. Every reader who picks up your novel is going to interpret it in a different way. They will each see your characters differently and get something unique out of reading it. This is great news, because it means you will always find an audience for your work, regardless, of your writing style. So, everyone can write a book. The contract – the promise you make to the reader. For example, when you read this book, you will find out if the Jackal will succeed in killing his victim, or if the lawyer escapes the corporate law firm. The crucible – this is another way of making sure that you do not let your characters drift. You need to set each one on their path and keep them contained and on that path. The clock – when writing a thriller you need to create a time pressure for your character. For example, if he or she does not solve the puzzle by midnight, a bomb will go off. This is part of the process of creating suspense and ensures that the thriller is fast paced enough. When I first heard about the 3 Cs, I struggled to understand what Dan was talking about. Fortunately, it did not put me off. I carried on with the course and it all became clear, by the end. Dan’s course is a bit like his books. Initially, you may not be able to fully understand everything. But, provided you bear with him, everything will be revealed. Like many writers, Dan mines the world around him to come up with ideas. He gets them from all kinds of places. But, he explains that by far the best way to come up with interesting ideas is “go educate yourself” about something that excites you. It could be anything. If something catches your attention, dive in and find out everything you can about it. Go online, talk to people involved in that field. Just make sure that it is something you are passionate about. Writing a book is a very long process, so you need to choose a subject that will keep you engaged. Also, try scanning the news. When something catches your attention, pause and find out more. The chances are the story that caught your eye will spark an idea for your novel. 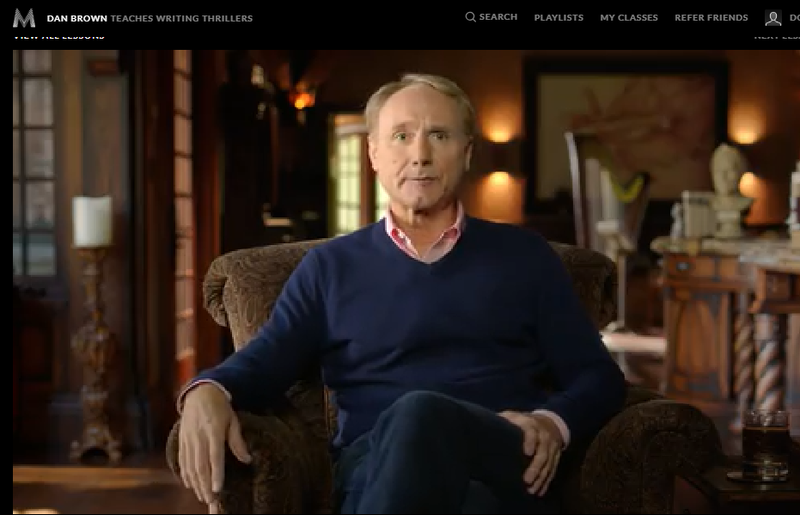 Later in the course, Dan Brown explains how to turn this idea into a full story. This is probably the most important section of the course. But, don’t be tempted to jump ahead to this video. Go through the others first and follow Dan’s exact process. It seems silly to think about your hero and villains before you build the story out, but, I promise you doing it that way works. 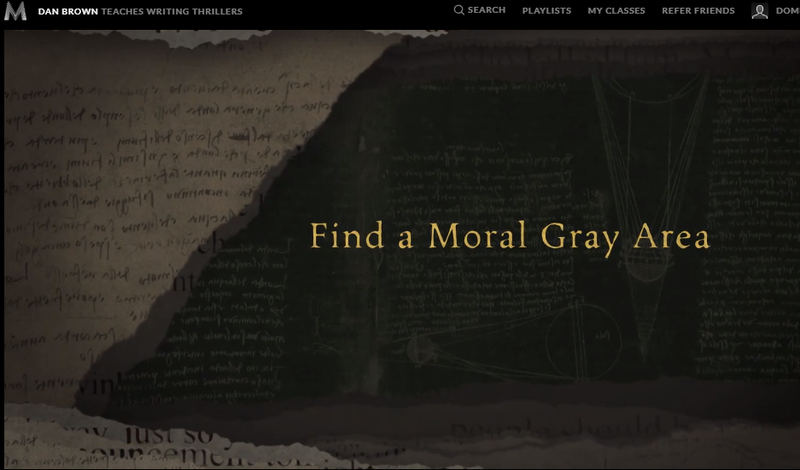 Finding a moral grey area is a great way to come up with a idea that works for a thriller. You can allow your characters to represent and explore both sides of these interesting dilemmas. Dan did this with Angels and Demon. He chose religion as his subject partly because it is such a contentious subject. It does a lot of good in the world, but, it can also have a negative impact. The right locations can frame your book and bring texture to your writing. Just be careful not to spend too much time describing them, you don’t want sections of your book to read like a travel blog. For me this section of the course led to a real aha moment. Thinking of the locations as a character is a fantastic tip. In this part of the course, Dan explains how to create heroes and villains that are suited to the world in which you are setting your novel. They need to believable. You also need to introduce them in the right way. Villains have to be introduced with a bang. This creates instant tension. Dan shares several practical ways to help you to understand how to do this. He does the same for the heroes. 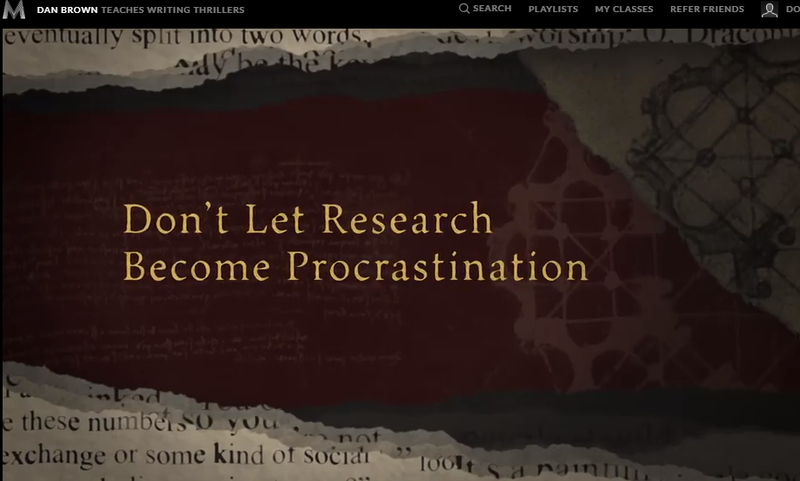 Dan Brown shares great shortcuts. Ways to make the writing process easier for yourself. His character tools section contains some of the best ones. For me, this was a tricky part of the course. It is really hard to know where to start when you do your research. It feels so overwhelming. So, I was pleased to hear Dan acknowledge this and explain how to take some of the pressure off. I can’t say hand on heart I fully understand this part of the process, after listening to Dan. But, I think what I have learned will make things a lot easier. Dan constantly talks about creating suspense, throughout the entire course. It is that important. When you go through these videos you will notice how important it is to create little cliffhangers. Dan is a master at drawing the reader in and compelling them to keep on turning the page. You want your reader not to be able to put your book down even though it is 2 am and they are so tired that they keep nodding off. Throughout the course, Dan shares lots of extra tips. For example, become a voracious reader. The more you read, the better your own writing will become, especially if you focus on the genre you want to write. Give the reader what they want in a way that they don’t see coming. These extra tips are invaluable and there are a lot of them. I have already gone through this course twice and the workbook several times and I am still noticing things I missed. Like all masterclass.com courses, you get lots of extras. You can find out more about these by reading my full review. There you can also find out about the masterclass.com all-access pass, which represents excellent value for money. The quality of these extra resources varies from course to course, but, I am really pleased to tell you that Dan Brown’s workbook is excellent. It contains everything in the video and a lot more besides. His office hours service is also great. The fact that, potentially, I can get my writing questions answered by Dan Brown himself still surprises and pleases me. I just wish his videos were time stamped, which would make going back at a later date and finding things again a bit easier. Throughout the course, Dan Brown provides examples to help the listener to fully understand what he is teaching them. This is very helpful as are the full case studies he provides. As you can tell, I am a big fan of this course. If you get the chance, please take it. You will enjoy it, I promise. This course would also make a great present for a budding writer. 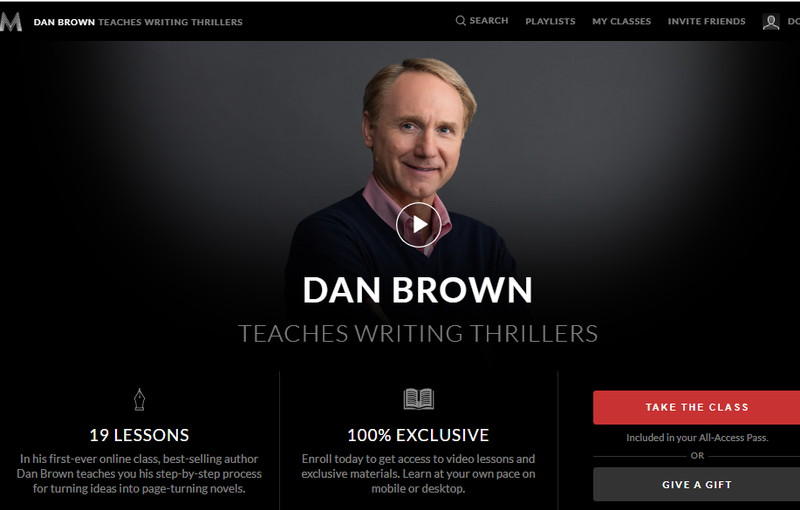 I also think that anyone who has read Dan Brown’s books will also enjoy taking his masterclass.